Most of us brush our teeth at least twice a day, starting when we first begin to see our teeth come in, to prevent tartar, plaque and bad breath. If you’ve ever wanted to find out what it would look like if you didn’t brush, though, the answer is not far away – just take a peek into your dog or cat’s mouth! Dental health for our pets has come a long way, but many pet owners don’t realize that their pet’s teeth and gums are at risk for the same types of dental problems that we suffer from as humans…as well as some unexpected problems that are exclusive to dogs and cats. At Gulf Coast Veterinary Specialists (GCVS), our board-certified veterinary dentist, Dr. Chanda Miles, has seen it all. We recently sat down with Dr. Miles and asked her to give us an example of a “routine” dental case, and also a “unique” dentistry case. 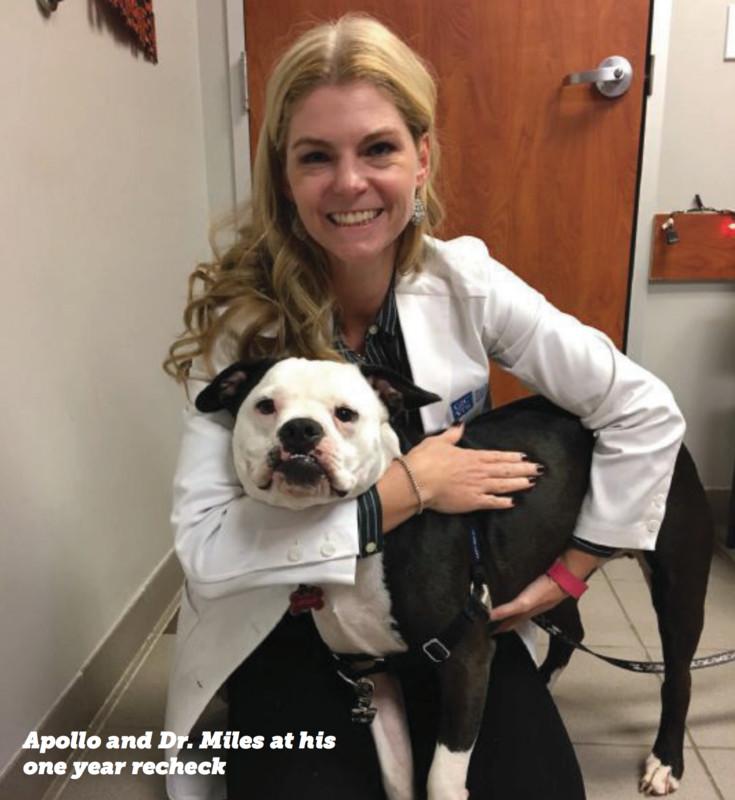 Dr. Miles’s pick for her unique case came in the form of a sweet, happy puppy named Apollo. 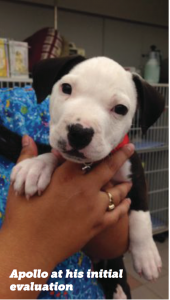 Apollo, a very young mixed breed puppy, had been horrifically mistreated. Apollo, his mother, and his siblings had been used as bait dogs in a dog fighting ring, and he was the only one to survive. As Dr. Miles evaluated Apollo, it became clear that his situation was dire. Apollo had suffered more maxillary (upper jaw) fractures than any other animal she had ever seen in her career. In addition, Apollo had a puncture wound on the roof of his mouth, causing a hole that communicated with his nose. It was a tricky situation – Apollo needed extensive surgery to repair the damage. But he has a spirit that just wouldn’t quit and Dr. Miles recently saw Apollo back for his ONE YEAR recheck! He’s still as sweet as he can be, and doing great. The case Dr. Miles chose for her “routine” case wasn’t life-threatening, but it was no less dramatic! Dr. Miles got a call from a pet owner who was very worried about her dog, Paxton. Paxton, a middle-aged mixed breed, was chattering his jaw when his owner would try and give his chin some scratches. When Dr. Miles and her team were able to evaluate Paxton, it turned out that several of his incisors (the tiny teeth at the very front of a dog’s mouth, between the canines), had such extensive periodontal disease that at least one of the teeth was loose enough to wiggle every time Paxton licked his lips or closed his jaw. How painful! Paxton’s surgery wasn’t nearly as extensive as Apollo’s, but the happiness his owner felt when he came home pain-free was exactly the same. Dental health is considered by many to be the foundation for maintaining good overall health for our pets, and your family veterinarian is a great resource for preventative care and maintenance of your pet’s dental needs. For instances where a more specialized dental procedure or service is required (like Apollo or Paxton), however, a referral and consultation with a veterinary dentist could be warranted, so check with your family veterinarian to give your pet a solid foundation of health for the future!